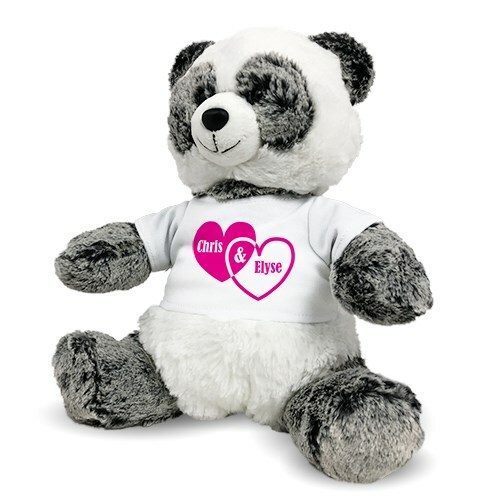 Personalized Panda Bear - Couples Hearts - 12"
Valentine's Day is a day to show your loved one how much they really mean to you. Your hearts with be connected forever with this custom bear! This romantic design is featured on our Ping Panda from the Aurora collection. Ping is a very cute and cuddly panda with super soft grey and white fur. With a loveable expression, this romantic panda makes a great gift for anyone on your shopping list. The T-shirt worn by Ping features our “couples hearts” design. Free personalization of any couples names are included. Ping measures 12” and includes free gift wrapping and a free gift message to create a thoughtful presentation. Rec'd bear sooner than expected. Wife loves it. Am happy with purchase. Bear is adorable and overall a great gift for your loved one! Additional Details Check out our great selection of Valentine's Day gifts to make that day extra special. While you're at it take a look at our Romance collection to find great love gifts for any occasion.